The unbeliever may think they are telling porkies, or that they are merely crusty old eccentrics but the gourmands of Ripponden will stop at nothing in their quest for perfection. At the weekend the Bridge inn Pork Pie Appreciation Society unveiled a speciallycommissioned plaque at Its weekly meeting place, the corner of the Bridge Inn, Ripponden. The plaque shows the River Ryburn, which runs alongside the pub and bears the initials of the 14 club members. They meet each week at the pub to sample pork pies from all over Britain and pass Judgement on them in a tradition founded on hunger pangs expe­rienced one fateful day in 1984. The club was started by five friends who met for a workout and sauna, each Saturday and retired to the Bridge Inn to eat pies. Pies are produced with a flourish and each member attempts to search out new sources, ensuring they are freshly-baked and fit for Inspection. After eating them each member delivers his verdict and marks out of 10 which are entered in a huge red minutes book by Mr John Denton. He also makes a note of key world events that day. One entry informs the reader that on one day Soviet president Mikhall Gorbachev was coming under pressure from rival Boris Yeltsin and Mr Peter Charnley thought his pie lacked spice! Pies are judged on the crispness of the pastry, well-seasoned filling and jelly and, above all, freshness. 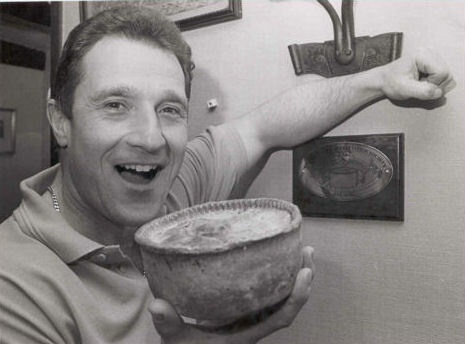 “Some of the lads have become such connoisseurs they can tell whether the pies are from a bakers or butchers and exactly when they were baked,” said member Mr John Edwards. ‘Anyone who stumbles across us In the pub when we are marking the pies looks at us in amazement. You can see them nudging each other and thinking what are those crackpots doing?” said Mr Edwards. Although he comes from Blackburn originally, Mr Edward., of Elland Road, Ripponden, admitted Lancastrlan pins dent begin to compare with the York­shire variety. Members are still prepared to go out­side the county however, in their quest for the perfect pie. Mr Denton, once had pie, specially delivered by Red Star from the West Country.